3. Department of Biomedical Sciences, College of Health Sciences, Qatar University, Doha, Qatar. Cell adhesion molecules (CAMs) are critical in early and late development, and play a major role in cellular communication as well as adhesion between cells and extracellular matrix . Alteration in the expression of CAMs results in loss of cellular morphology and tissue architecture, a characteristic feature of neoplastic transformation [2, 3]. Furthermore, deregulation of CAMs, such as E-cadherin results in epithelial-mesenchymal transition, thus promoting tumor invasion and metastasis [1, 4]. CD44, a member of the CAM family, along with its role in cellular adhesion, is largely involved in intracellular signaling for cell growth, proliferation and motility . CD44 is involved in the onset of several tumors including neuroblastomas, breast, ovarian, cervical, prostate, lung and, colon cancers . While in neuroblastomas, CD44 acts as a tumor suppressor, its role is controversial in prostate (PC) and breast cancers (BC) [6, 7]. Interestingly, in BC, CD44 expression was associated with poor and favorable outcomes, thus indicating the dual nature of CD44 in mediating breast tumor development. Therefore, in order to address this discrepancy, and further elucidate the mechanisms by which CD44 acts to either suppress or promote BC invasion, our laboratory established a tetracycline inducible systems both in vitro and in vivo, and demonstrated that induction of CD44 promoted breast tumor cell invasion in vitro , as well as metastasis of breast tumor to the liver . To gain a better understanding of the molecular mechanisms associated with CD44s downstream signaling in breast tumor progression, we performed gene expression profiling analysis and validated Survivin (SVV) Cortactin (CTN) and TGF-beta2 as novel target genes that underpin CD44-promoted invasion of BC cells [8-10]. In this review, we aim to discuss the contribution of these three novel signaling pathways (SVV, CTN and TGF-β2) to the current mechanisms by which CD44 promotes BC progression, and the potential of using these novel targets to guide the design of anti-BC therapeutic strategies. In humans, CD44 proteins are encoded by a highly conserved gene, located on the short arm of chromosome 11 (11p13), spanning the region 35,138,869 to 35,232,401. The standard form of CD44 protein consists of 742 amino acids; The CD44 gene encodes for more than 100 isoforms ranging from 80 to 200 kDa. The heterogeneity of this group is due to alternative splicing and protein modification as posttranscriptional regulation . CD44 encompasses 20 exons spanning a length of 60 kb, with the first five exons (Exons 1-5) and the last 5 exons (Exons 1-9) being conserved in all the isoforms; they encode the N-terminal (extracellular) and C-terminal (extracellular, transmembrane and, cytoplasmic) domains, respectively for all CD44 isoforms . The remaining 10 intermediate exons (Exons 5a-14; v1-v10) can be involved in alternative splicing, thus generating several CD44 variants (Figure 1). Post-translational modifications with N-glycosylation, O-glycosylation and glycosaminoglycannation by heparan sulphate or chondroitin sulphate results in the generation of multiple isoforms (at least 20 are identified) of variable molecular sizes (85-230 kDa), suggesting the involvement of CD44 in various cellular processes [11, 12]. The non-variant standard form of CD44, CD44s, also known, as hematopoietic CD44 (CD44H) is the smallest molecule (85-95kDa), encoded by the conserved exons and is the highly expressed CD44 isoform, and is present on the surface of most vertebrate cells . 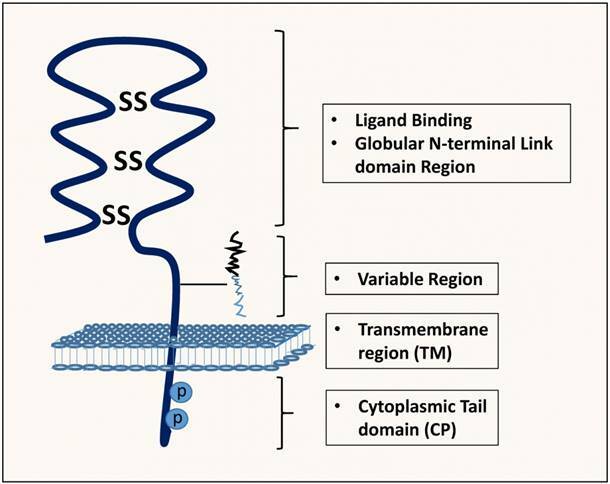 It is a single-chain molecule consisting of various domains; distal extracellular domain (N-terminal) comprising ligand-binding sites, a membrane-proximal region, transmembrane domain and, a cytoplasmic domain (Figure 2) . The variant isoforms of CD44 (CD44v) are detected by the presence of variant exons and their expression is upregulated by T-lymphocytes and other leukocytes post-immunological activation. Moreover, these variants have tissue-specific expression, regulated by different environment and tissue-specific factors, as well as oncogenic pathways, particularly the Ras-MAPK pathways that control alternative splicing during cancer progression [12, 13] While CD44 lacking v2-v10 is the most common form on hematopoietic cells; larger CD44 splice variants are present on normal and neoplastic epithelia, activated lymphocytes and malignant lymphomas . CD44v8-10 (CD44E) is frequently dominant on epithelial cells, while the longest CD44 isoform, CD33v3-10, expressing eight exons of the variable region is present in keratinocytes . Extracellular proteins including hyaluronan (HA), collagen, flaminin, fibronectin and osteopontin are the known ligands for CD44 [14-18]. Osteopontin can bind to the variants, CD44v6 and v7, to initiate cell survival, migration, invasion and angiongenesis signaling . CD44 is the chief cell receptor for hyaluronan (HA), but it is ubiquitous as the gene encodes a number of isoforms, generated by alternative splicing of 10 "variant" exons. The expressions of the variant isoforms are associated with different types of cancers, and their expression on some cell types can be modulated by particular cytokines. CD44 isoforms are heterogeneously expressed in breast cancer and correlate with tumor subtypes and cancer stem cell markers . Structure of CD44. The exons coding for the various CD44 isoforms are numbered, and the different domains of the protein, including the extracellular, the intracellular, and the transmembrane domains are shown. The (Dark blue)-colored exons illustrate the exons that exhibit alternative splicing and their rearrangement, resulting in different variant isoforms of CD44. The exons 1-5 correspond to the N-terminal extracellular domain, while the exons 18 and 19 of the C-terminal, correspond to the cytoplasmic tail of CD44. Structure, binding domains and interactions of CD44. The CD44 protein is composed of an extracellular link domain where the variant isoform is located with 292-300 a.a, a stalk-like region in the extracellular module stabilized by disulphide bonding of 6 cysteine residues and contains binding sites for hyalurona hyaluronan-binding motifs (HA) as well as facilitate its interactions with matrix metalloproteinases (MMPs) and other growth factors/growth factor receptors. Close to The transmembrane region (TM), the variant exon products (Variable region) are inserted. The cytoplasmic tail (CP) and Transmembrane domain undergo both phosphorylation on cysteine and serine residues and palmitoylation, respectively with crucial binding motifs for Ankyrin, ErbB2, epidermal growth factor receptor-2; ERM/Merlin, ezrin/radixin/moesin; disulphide bonds, PI3K, phosphoinositide 3-kinase, cytoskeletal linker proteins and SRC kinases. CD44 is responsible for activating a series of key signaling pathways, including RhoGTPases, Ras-MAPK and, PI3K/AKT pathways. Since CD44 lacks intrinsic kinase activity, it initiates signaling by adapting intracellular kinases and adaptor proteins that bind the cytoplasmic tail of CD44 to the actin cytoskeletion . CD44 can stimulate signaling by interacting with cell-surface associated growth factors, enzymes and cytokines . CD44-signal transduction occurs through several mechanisms such as binding of HA to CD44 resulting in the extracellular clustering of CD44, and subsequent activation of downstream kinases (Tiam1, p115, Rac1, c-Src and FAK as well as Rho and Rac) thereby promoting cell migration [23-25]. Bourguinion et al, showed that Rho-kinase plays a pivotal role in CD44v(3,8-10)-ankyrin interaction and RhoA-mediated oncogenic signaling, required for tumor cell migration . Furthermore, while CD44 interacts with Ezrin/Radixin/Moesin (ERM) proteins to facilitate actin cytoskeletal remodeling and cell invasion , activation of PI3K and inhibition of Merlin by Pak2, inhibits CD44 and ERM binding; this leads to deregulation of cytoskeletal remodeling and promotes cellular invasion [28, 29]. Interestingly, CD44 serves as a co-receptor physically associated with several other signaling receptors [23-25]. Although, in BC cells, CD44 is known to interact with EGFR and HER2, our understanding of the underlying signaling mechanisms is nascent [30, 31]. As matter of fact, HA/CD44 can activate Grb2 and p185Her2, resulting in the binding of CD44 to N-Wasp, thereby promoting Ras- and SOS-mediated growth and invasion [32, 33]. Met, receptor for hepatocyte growth factor is expressed upon the CD44v6-ERM interaction and inhibition of Ras-SOS signaling cascade . Furthermore, CD44v6 is known to trigger endothelial cell migration via activation of c-Met and VEGFR-2 in response to hepatocyte growth factor or VEGF-A; a process which requires binding of CD44 to ERM proteins [35, 36]. Moreover, CD44 interacts with TGFβ-1 and -2 allowing ankyrin-CD44 interaction to promote Smad-dependent cell invasion . Surprisingly, CD44 can alter angiogenesis by coupling to hyaluronidase hyal2 along with transmembrane sodium-hydrogen exchanger, NHE1, thereby stimulating cathepsin-B to promote invasion, all illustrated in (Figure 3) [38, 39]. CD44 can regulate various oncogenic signals through several key signaling networks, including activation of RhoGTPases and PI3K/AKT pathway, which augments cytoskeletal remodeling, growth, survival and invasion; the hallmarks of tumor progression . CD44 couples with major oncogenes to enhance their activity and promote tumorigenesis and angiogenesis. Furthermore, binding of HA to CD44 augments a series of cell signaling events through the activation of CD44 C-terminal bound proteins such as ankyrin, merlin, and ERM. The CD44 cytoplasmic tail is directly associated with actin filaments in a process mediated by ERM proteins . Also, CD44 functions as a docking site for MMPs such as MMP-9, allowing degradation of collagen and invasion. Docking of MMPs promotes binding of TGF-β, thus allowing tumor invasion and angiogenesis [42, 43]. HA-mediated motility receptor  and CD44 interaction is associated with metastasis, and RHAMM is over-expressed in several tumors including tumors of the ovaries, colon, stomach and acute leukemia [44, 45]. Although numerous in-vitro studies showed that CD44 promotes tumor progression, others contradicted its role in tumor progression; its interaction with high molecular weight HA represses tumor growth, angiogenesis and invasion [5, 46]. In a recent study, CD44 interaction with high molecular weight HA blocked invasion of several BC cell lines . However, another study reported that small molecular weight oligomerized HA to initiate apoptosis and inhibit PI3K/AKT activation in colon cancer cells and murine mammary cancer cells . The role of CD44 in BC progression is controversial. CD44 is known to promote BC progression and metastasis through the binding of CD44 to its major ligand HA, or to other ligands, including osteopontin, fibronectin, collagen IV, and laminin . Various isoforms of CD44 play a major role in the different stages of BC progression and its prognosis [47, 50, 51]. Loss of CD44s is linked to increased risk of metastasis . Furthermore, loss of CD44s expression has been observed in malignant BC tissues as compared to benign breast tissues . However, our recent in vivo study, contradicted this finding, showing that CD44s promoted breast tumor invasion and metastasis to the liver . Other studies support our findings, indicating that the different variants, CD44v3, CD44v6 and, Cd44v7-8 were positively associated with breast tumor progression, poor prognosis, and survival rate [52, 53]. Also, the expression of soluble CD44v6 was upregulated in tumor tissues and was associated with large tumor size and lymph node metastasis . In a study conducted on invasive cribriform breast tumors, while variants CD44v3 and v6 were upregulated, the variant, CD44v4 was downregulated . However, another contradictory study showed that elevated expression of CD44v4 promoted BC trans-endothelial cell metastasis . In a recent study, upregulation of CD44 and absence of CD24 in BC stem cells were associated with tumorigenesis and poor patient survival rate [57-59]. 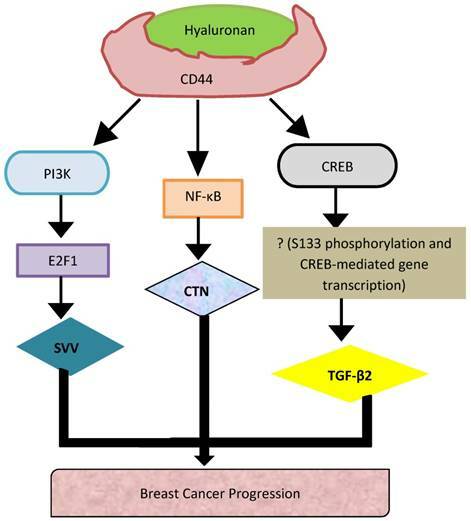 Interestingly, with respect to hormone receptors, the expression of CD44v6, CD44s and CD44v9 was positively correlated with breast carcinoma tissues displaying high levels of estrogen and progesterone receptors . Our recent work showed that upregulation of CD44s promoted BC metastasis to the liver . To gain a better understanding of the molecular mechanisms associated with CD44s-downstream signaling in breast tumor progression, we performed microarray gene expression profiling and identified Survivin, Cortactin and TGF-β2 as novel target genes in underpinning CD44-promoted invasion of BC cells [8-10]. The following sections will review and discuss the characterization of these novel CD44-signaling pathways (SVV, CTN and TGF-β2) promoting BC tumor cell invasion. Although a number of studies have been conducted to understand the upstream signaling mechanisms regulating CD44 activity , the CD44-downstream signaling mechanisms remain nascent. Using both in vitro and in vivo CD-44 inducible BC cell systems, our recent work reported that induction of CD44s increased the invasive ability of BC cells  and their metastasis to the liver . Furthermore, we showed that HA activation of CD44 initiated nuclear localization of NF-κB to bind the promoter of CTN, and activate its expression, and thus promoting BC progression . However, HA binding to CD44 activates the PI3K pathway leading to the release of E2F1, which translocate to the nucleus to activate the transcription of SVV. We have previously identified EMS/cortactin as a transcriptional target of HA/CD44 signaling [8-10], a gene whose expression is upregulated in at least 15% of BCs and is associated with poor prognosis and relapse; majorly being linked with gene amplification of chromosome 11q13 . CTN plays a role in the polymerization of the actin cytoskeleton; thus allowing cells to lose their adherence capability and become motile , a feature allowing the cancer cells in-vitro to adhere to bone-marrow endothelial cells and trigger metastasis to the bone in-vivo . In invasive BC cells, CTN forms a complex with paxillin and PKCµ, thus regulating cell motility and adhesion. Furthermore, overexpression of CTN in BC cells, restricts the ubiquitination-mediated breakdown of the epidermal growth factor receptor , leading to a prolonged ligand-initiated EGFR activity [65, 66]. CTN has been described to be a signaling target of CD44-activated p60 Src kinase . CTN has been identified to regulate E-selectin and ICAM-1 activity to allow adherence of leukocytes to endothelial cells at sites of inflammation . Our previous studies revealed the molecular mechanisms that underpin CD44-promoted BC metastasis and identified NF-κB as the main transcription factor involved in CTN regulation . Upon pharmacological inhibition of NF-κB in MCF7-B5 cells using IκKinase-2 inhibitor SC514 or RNAi-mediated inhibition of p65 Rel A expression, induced HA/CD44 induced followed by increased CTN levels . Furthermore, we identified two other critical transcriptional CD44 downstream-target genes, survivin (SVV) and transforming growth factor-β2 (TGF- β2) that mediate breast tumor invasion and metastasis [8, 9, 61]. SVV plays a pivotal role as an anti-apoptotic factor, cell survival and resistance to chemotherapy. SVV has three distinctive features, making it distinct from other anti-apoptotic proteins: (i) Although, SVV is moderately expressed in normal human tissues, it is however overexpressed in human tumors, (ii) SVV inhibits the pro-apoptotic functions of caspases, due to its baculovirus apoptosis-inhibitor repeat domain, and  SVV is merely the only anti-apoptosis protein firmly regulated throughout the process of cell cycle . SVV has a dual role as its serves as an anti-apoptotic and a promoter of cell survival and proliferation, thus, making it a potential molecular target for BC therapy . In a murine BC model, mice treated with a plasmid (construct of mouse SVV phosphorylation T34A mutant) inhibited metastasis of BC to the lung . Furthermore, siRNA-inhibition of SVV significantly reduced colorectal cancer cell proliferation and abolished resistance to radiotherapy . A dominant-negative form of SVV inhibited both BC cell proliferation and angiogenesis . Despite significant number of studies from the literature exploring SVV function, its role in the onset and the progression of BC, as well as its underlying mechanisms are still nascent. In fact, we have identified a novel relationship between CD44/HA signaling and the transcription of SVV in BC cells using microarray analysis . Specific siRNA inhibition of induced or endogenous CD44 expression reduced SVV expression, which was functionally accompanied by a decrease in BC cell invasiveness . Furthermore, we revealed that HA/CD44/PI3K/ activating the transcription of SVV is the underlying molecular signaling mechanism . Activation of E2F1 increased SVV expression, possibly via direct interaction with the SVV promoter, leading to breast tumor cell invasion . Nevertheless, further work is required to determine the molecular link between SVV and induction of breast tumor invasion. More interestingly, we have identified and validated an additional protein, transforming growth factor β2 (TGF-β2), (2.9 fold induction) as a novel potential CD44s-target involved in breast tumor cell invasion . TGF-β2 is a part of the large family of polypeptide growth factors, involved in the regulation of various biological processes such as cellular growth, proliferation, angiogenesis, immune response, cell death, extracellular matrix synthesis and differentiation . TGF has three isoforms that are generally secreted as precursor molecules, all being triggered either by protolytic cleavage, pH change or interaction with integrins . The active form of TGF tends to bind to certain receptors, transmembrane serine/threonine kinases, all being known to activate the SMAD signaling cascade . Several studies showed that TGF-β2 is involved in the onset and progression of several tumors, including ovarian  and pancreatic  cancer, melanoma  and malignant epidermal keratinocytes . TGF-β2 activation is a crucial step in the CD44-downstream event during tumor cell survival and proliferation . Furthermore, polymorphism in TGF-β2 promoter increased its protein expression levels, which was associated with lymph node metastasis in BC patients, thus providing evidence of the role of TGF-β2 in the process of breast tumor invasion . Epithelial-mesenchymal transition (EMT) was associated with cancer invasion and metastasis, and TGF-β signaling cascade is known to regulate EMT in the breast [80, 81]. Recent study showed that HA/CD44-moesin complex, linked with TGF-β2 receptor II and clathrin at actin microdomains, promotes activation of TGF-β signaling; this results in actin remodeling, thus causing cell-cell detachments and increased cell motility . Our study provided evidence that TGF-β2 is a downstream transcriptional target of CD44-mediated BC invasion, which could stimulate TGF-β2 transcription through the activation of the transcription factor, cAMP response element-binding protein (CREB) . Data from several previous studies support our findings. In fact, CD44 undergoes a series of chronological metalloprotease and ϒ-mediated proteolytic cleavage, resulting in the release and translocation of CD44 intracellular domain (CD44-ICD) to the nucleus; CD44-ICD can bind CREB, increases phosphorylation of S133 and triggers CREB-mediated gene transcription, leading to activation of TGF-β2 [21, 82, 83]. Interestingly, , cAMP response element/activating transcription factor (CREB/ATF) and E-motif were found within the TGF-β2 gene promoter just upstream the transcription start site, and were necessary for the TGF-β2 gene transcription . Experiments are being carried out in our laboratory to further validate the in-vivo functional role of CD44/CREB/ TGF- β2 signaling pathway in breast tumor progression and metastasis. The promoter region of CD44 consists of a CpG island, which when undergoes hypermethylation at the CpG dinucleotides will suppress transcription of CD44s in prostate cancer (PCa) . Furthermore, loss of CD44s expression is used to predict PCa recurrence in surgically treated patients . As mentioned above, Rho plays a critical role in promoting CD44 expression; Elevated levels of Rho GTPases by certain CD44 variants tend to upregulate CD44/MMP-9 interaction, MMP-9 secretion and cell motility, a crucial step in PCa progression [86, 87]. The variants, CD44v6 and CD44v7-10 have been positively linked with PCa . In colon cancer, elevated expression of CD44v6 and CD44v8-10 is reported to promote HA binding, tumorigenicity and distant metastasis. Furthermore, variant, CD44v3 along with heparanase is also linked with colon cancer metastasis [89, 90]. Upregulated expression of CD44 with its variant CD44v6 has been positively correlated with colon cancer progression and spread, and is also a marker for poor prognosis and survival [91, 92]. Several CD44v isoforms are overexpressed in malignant colon cancer cells; CD44v3, v5, v6 and v8-10 have been suggested to be possible prognostic indicators in colon cancer [91, 93-95]. On the other hand, expressions of CD44 isoforms, including single-variants (Exons v3, v4, v6 or v9) were downregulated in brain cancers . Interestingly, multiple CD44 variants were upregulated in metastatic brain tumors, while these isoforms were absent in cells metastasizing to the spine . In a separate study, CD44s, CD44v3, CD44v4, CD44v6, and CD44v7 expression was reduced in pancreatic cancer cells as compared to normal cells . Interestingly, expression of the variant CD44v2 was expressed in pancreatic tumor cells, and was correlated with vessel invasion . In another study, CD44 isoforms (Cd44s, v5, v6, v7-8 and v10) were highly expressed in poorly differentiated hepatocellular carcinoma and correlated with poor survival rate . Furthermore, CD44v6 was linked to vascular invasion . In non-squamous cell lung carcinoma, upregulated expression of CD44v6 was associated with metastasis and poor prognosis; however, in adenocarcinoma and large cell lung carcinoma, loss of CD44v6 and CD44v3 were associated with poor prognosis and correlated with invasion of lung adenocarcinoma [101, 102]. In stages II and III of rectal cancer, CD44v6 was associated with predicting recurrence of locally advanced adenocarcinoma . Also, CD44v6 and v7-8 have been identified as predictors of cervical cancer at earlier stage . In Non-Hodgkin Lymphoma, variants, CD44v6-10 were highly expressed. Studies using in-vivo models reported that CD44ex10 was positively correlated with the onset of tumor and metastasis as compared to the larger exon 10 variants (CD44ex10-14 and CD44ex7-14) and CD44H . CD44 is a multifaceted molecule involved in several biological and pathological processes. CD44 plays a crucial role in the process of metastasis, including EMT, cellular growth, proliferation, invasion and motility. Its role in metastasis was first identified in pancreatic cancer . Several studies have suggested its role in different stages of tumor progression. CD44 can act as both, tumor promoter and tumor suppressor depending on cancer cell type. Since its role was controversial in cancer, our laboratory has extensively investigated its role in BC using Tet-Off inducible system combined with microarray analysis and various molecular and functional approaches, in order to better understand its precise function in metastasis and further determine the specific underlying mechanisms. We have indeed discovered and functionally validated three disctinct novel signaling pathways, HA-CD44/PI3K/E2F1/SVV, HA-CD44/ NF-κB/CTN, and HA-CD44/CREB/TGF-β2 as novel CD44-downtream signaling pathways underpinning CD44-promoted breast tumor cell invasion (Fig. 2). One of the major elements required for improving the longevity and quality of a patient's life is the development of early detection methods and targeted therapies that can aid in controlling cancer metastasis. Although, CD44 is not a stable marker for luminal BC subtypes, it frequently serves as a marker for triple-negative BC [106, 107]. Our long-term objective is to gain a comprehensive understanding of the molecular mechanisms of CD44-mediated BC progression and metastasis, in order to identify molecular candidates that can serve as biomarkers and /or targets to pave the way towards the design of efficient anti-metastasis therapeutic strategies.